Published in L. Frank Baum's first children's book, Mother Goose in Prose (1897), illustrated by Maxfield Parrish. You might also enjoy the illustrated nursery rhyme, Sing a Song of Sixpence. If you have never heard the legend of Gilligren and the King's pie, you will scarcely understand the above verse; so I will tell you the whole story, and then you will be able to better appreciate the rhyme. Gilligren was an orphan, and lived with an uncle and aunt who were very unkind to him. They cuffed him and scolded him upon the slightest provocation, and made his life very miserable indeed. Gilligren never rebelled against this treatment, but bore their cruelty silently and with patience, although often he longed to leave them and seek a home amongst kinder people. It so happened that when Gilligren was twelve years old the King died, and his son was to be proclaimed King in his place, and crowned with great ceremony. People were flocking to London from all parts of the country to witness the festivities, and the boy longed to go with them. "If I had sixpence I could make my fortune." "Pooh! nonsense!" exclaimed his uncle, "a sixpence is a small thing. How then could you make a fortune from it?" "That I cannot tell you," replied Gilligren, "but if you will give me the sixpence I will go to London, and not return until I am a rich man." "The boy is a fool!" said his uncle, with anger; but the aunt spoke up quickly. "Give him the money and let him go," she said, "and then we shall be well rid of him and no longer be obliged to feed and clothe him at our expense." "Well," said her husband, after a moment's thought, "here is the money; but remember, this is all I shall ever give you, and when it is gone you must not come to me for more." "Never fear," replied Gilligren, joyfully, as he put the sixpence in his pocket, "I shall not trouble you again." The next morning he cut a short stick to assist him in walking, and after bidding goodbye to his uncle and aunt he started upon his journey to London. "The money will not last him two days," said the man, as he watched Gilligren go down the turnpike road, "and when it is gone he will starve to death." "Or he may fall in with people who will treat him worse than we did," rejoined the woman, "and then he 'll wish he had never left us." But Gilligren, nothing dismayed by thoughts of the future, trudged bravely along the London road. The world was before him, and the bright sunshine glorified the dusty road and lightened the tips of the dark green hedges that bordered his path. At the end of his pilgrimage was the great city, and he never doubted he would find therein proper work and proper pay, and much better treatment than he was accustomed to receive. So, on he went, whistling merrily to while away the time, watching the sparrows skim over the fields, and enjoying to the full the unusual sights that met his eyes. At noon he overtook a carter, who divided with the boy his luncheon of bread and cheese, and for supper a farmer's wife gave him a bowl of milk. When it grew dark he crawled under a hedge and slept soundly until dawn. The next day he kept steadily upon his way, and toward evening met a farmer with a wagon loaded with sacks of grain. "Where are you going, my lad?" asked the man. "To London," replied Gilligren, "to see the King crowned." "Have you any money?" enquired the farmer. "Oh yes," answered Gilligren, "I have a sixpence." "If you will give me the sixpence," said the man, "I will give you a sack of rye for it." "What could I do with a sack of rye?" asked Gilligren, wonderingly. "Take it to the mill, and get it ground into flour. With the flour you could have bread baked, and that you can sell." "That is a good idea," replied Gilligren, "so here is my sixpence, and now give me the sack of rye." The farmer put the sixpence carefully into his pocket, and then reached under the seat of the wagon and drew out a sack, which he cast on the ground at the boy's feet. "There is your sack of rye," he said, with a laugh. "But the sack is empty!" remonstrated Gilligren. "Oh, no; there is some rye in it." "But only a handful!" said Gilligren, when he had opened the mouth of the sack and gazed within it. "It is a sack of rye, nevertheless," replied the wicked farmer, "and I did not say how much rye there would be in the sack I would give you. Let this be a lesson to you never again to buy grain without looking into the sack!" and with that he whipped up his horses and left Gilligren standing in the road with the sack at his feet and nearly ready to cry at his loss. "My sixpence is gone," he said to himself, "and I have received nothing in exchange but a handful of rye! How can I make my fortune with that?" He did not despair, however, but picked up the sack and continued his way along the dusty road. Soon it became too dark to travel farther, and Gilligren stepped aside into a meadow, where, lying down upon the sweet grass, he rolled the sack into a pillow for his head and prepared to sleep. The rye that was within the sack, however, hurt his head, and he sat up and opened the sack. "Why should I keep a handful of rye?" he thought, "It will be of no value to me at all." So he threw out the rye upon the ground, and rolling up the sack again for a pillow, was soon sound asleep. When he awoke the sun was shining brightly over his head and the twitter and chirping of many birds fell upon his ears. Gilligren opened his eyes and saw a large flock of blackbirds feeding upon the rye he had scattered upon the ground. So intent were they upon their feast they never noticed Gilligren at all. He carefully unfolded the sack, and spreading wide its opening threw it quickly over the flock of black birds. Some escaped and flew away, but a great many were caught, and Gilligren put his eye to the sack and found he had captured four and twenty. He tied the mouth of the sack with a piece of twine that was in his pocket, and then threw the sack over his shoulder and began again his journey to London. "I have made a good exchange, after all," he thought, "for surely four and twenty blackbirds are worth more than a handful of rye, and perhaps even more than a sixpence, if I can find anyone who wishes to buy them." He now walked rapidly forward, and about noon entered the great city of London. Gilligren wandered about the streets until he came to the King's palace, where there was a great concourse of people and many guards to keep intruders from the gates. Seeing he could not enter from the front, the boy walked around to the rear of the palace and found himself near the royal kitchen, where the cooks and other servants were rushing around to hasten the preparation of the King's dinner. Gilligren sat down upon a stone where he could watch them, and laying the sack at his feet was soon deeply interested in the strange sight. Presently a servant in the King's livery saw him and came to his side. "What are you doing here?" he asked, roughly. "I am waiting to see the King," replied Gilligren. "The King! The King never comes here," said the servant; "and neither do we allow idlers about the royal kitchen. So depart at once, or I shall be forced to call a guard to arrest you." Gilligren arose obediently and slung his sack over his shoulder. As he did so the birds that were within began to flutter. "What have you in the sack?" asked the servant. "Blackbirds!" echoed the servant, in surprise, "well, that is very fortunate indeed. Come with me at once!" He seized the boy by the arm and drew him hastily along until they entered the great kitchen of the palace. "Here, Mister Baker!" the man called, excitedly, "I have found your blackbirds!" A big, fat man who was standing in the middle of the kitchen with folded arms and a look of despair upon his round, greasy face, at once came toward them and asked eagerly, "The blackbirds? are you sure you can get them?" "They are here already; the boy has a bag full of them." "Give them to me," said the cook, who wore a square cap, that was shaped like a box, upon his head. "What do you want with them?" asked Gilligren. "I want them for a pie for the King's dinner," answered Mister Baker; "His Majesty ordered the dish, and I have hunted all over London for the blackbirds, but could not find them. Now that you have brought them, however, you have saved me my position as cook, and perhaps my head as well." "But it would be cruel to put the beautiful birds in a pie," remonstrated Gilligren, "and I shall not give them to you for such a purpose." "Nonsense!" replied the cook, "the King has ordered it; he is very fond of the dish." "Still, you cannot have them," declared the boy stoutly, "the birds are mine, and I will not have them killed." "But what can I do?" asked the cook, in perplexity; "the King has ordered a blackbird pie, and your birds are the only blackbirds in London." Gilligren thought deeply for a moment, and conceived what he thought to be a very good idea. If the sixpence was to make his fortune, then this was his great opportunity. "You can have the blackbirds on two conditions," he said. "What are they?" asked the cook. "One is that you will not kill the birds. The other condition is that you secure me a position in the King's household." "How can I put live birds in a pie?" enquired the cook. "Very easily, if you make the pie big enough to hold them. You can serve the pie after the King has satisfied his hunger with other dishes, and it will amuse the company to find live birds in the pie when they expected cooked ones." "It is a risky experiment," exclaimed the cook, "for I do not know the new King's temper. But the idea may please His Majesty, and since you will not allow me to kill the birds, it is the best thing I can do. As for your other condition, you seem to be a very bright boy, and so I will have the butler take you as his page, and you shall stand back of the King's chair and keep the flies away while he eats." The butler being called, and his consent secured, the cook fell to making the crusts for his novel pie, while Gilligren was taken to the servants' hall and dressed in a gorgeous suit of the King's livery. When the dinner was served, the King kept looking for the blackbird pie, but he said nothing, and at last the pie was placed before him, its crusts looking light and brown, and sprigs of myrtle being stuck in the four corners to make it look more inviting. Although the King had already eaten heartily, he smacked his lips when he saw this tempting dish, and picking up the carving-fork he pushed it quickly into the pie. At once the crust fell in, and all the four and twenty blackbirds put up their heads and began to look about them. And coming from the blackness of the pie into the brilliantly lighted room they thought they were in the sunshine, and began to sing merrily, while some of the boldest hopped out upon the table or began flying around the room. At first the good King was greatly surprised; but soon, appreciating the jest, he lay back in his chair and laughed long and merrily. And his courtiers and the fine ladies present heartily joined in the laughter, for they also were greatly amused. "Sirrah! how came you to think of putting live birds in the pie?" "May it please your Majesty, it was not my thought, but the idea of the boy who stands behind your chair." "You are a clever youth, and deserve a better position than that of a butler's lad. Hereafter you shall be one of my own pages, and if you serve me faithfully I will advance your fortunes with your deserts." And Gilligren did serve the King faithfully, and as he grew older acquired much honor and great wealth. "After all," he used to say, "that sixpence made my fortune. And it all came about through such a small thing as a handful of rye!" You might also enjoy the nursery rhyme, Sing a Song of Sixpence. 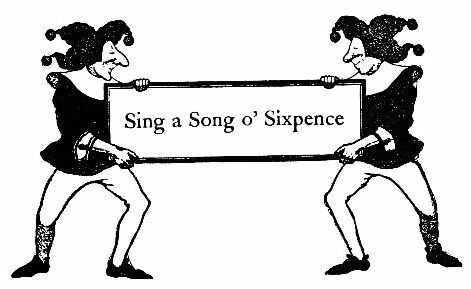 Add Sing A Song O' Sixpence to your own personal library.